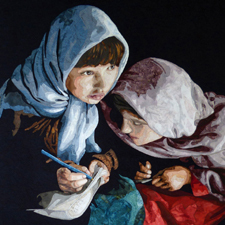 'EAGER TO LEARN-AFGHANISTAN' - 2015 Winner 'World of Beauty' Award, International Quilt Show, Houston USA. 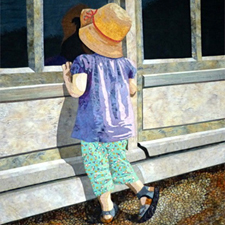 'CURIOUS CATE' 2012 - Award of Excellence 'Best Use of Colour' and 'Viewer's Choice' Queensland Quilt Show. 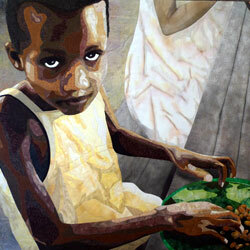 'TOO EASILY FORGOTTEN' 2012 - Finalist in the APQ/AQC Challenge. Exhibited AQC Melbourne. 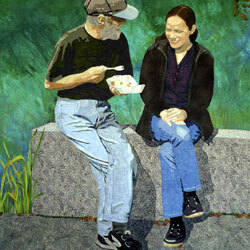 'JOHN AND SUE' 2011 - 1st place Pictorial and Best Wall Quilt at Queensland Quilt Show. Exhibited AQC Melbourne. 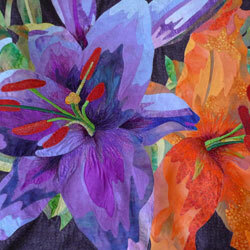 'LILIUM' 2009 - 1st place First Time Entrant at Queensland Quilt Show. 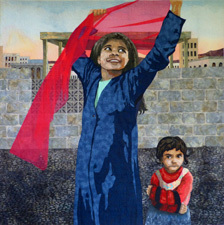 'I AM NUJOOD AND I AM FREE!' 2013 - Runner-up AQC Challenge 2013.